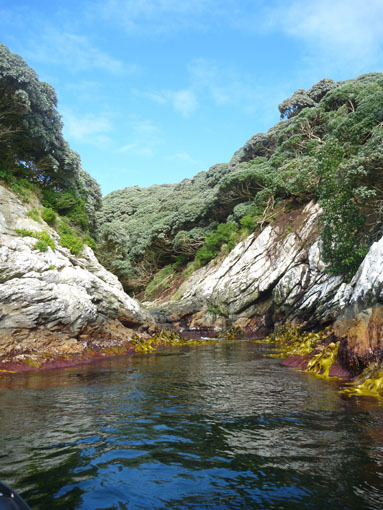 After leaving the port of Bluff, we took our sunset cruise down past Stewart Island on towards the Snares, our first port of call in Our Far South. Snares Island. Photo Antonvan Helden, copyright Te Papa. The first marine mammal spotting of the trip was a small pod of Southern right whale dolphins, these spectacularly sleek animals have no dorsal fin and gave the imprssion of being giant penguins porpoising along. 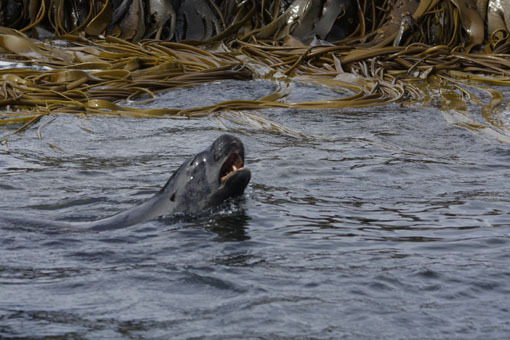 They are just one of the many species of marine mammal which inhabit our rich southern waters. 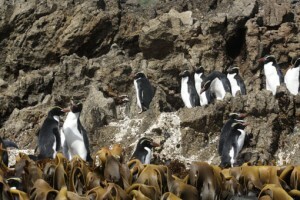 Snares crested penguins. Photo Anton van Helden, copyright Te Papa. Into the zodiacs we went to explore the rugged coastline of these islands. Devoid of any introduced predators they are remarkable for the abundance of bird, from the tiny black tomtits and fern birds to the soaring Buller’s Mollymawks. The islands with their tree daisy and leatherwood shrub coverings are home to a massive number of Sooty Shear waters whose burrows festoon the island. 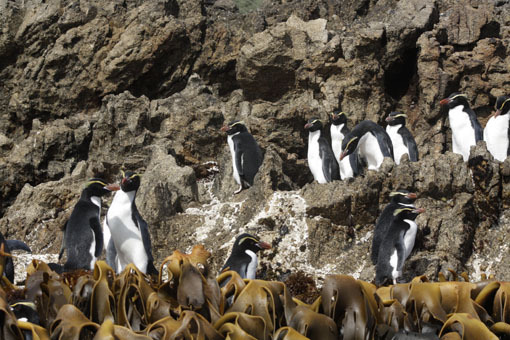 Groups of Snares crested penguins could be seen gathered along the rocky coastal cliffs, while the exposed coastline is covered with massive clumps of bull kelp. Sea lion, Snares Is. Photo Anton van Helden, copyright Te Papa. The islands are also home to New Zealand Fur seals, hunted in vast numbers in the late 1790’s to about 1830 when it was no longer economic for sealers to hunt them. A few sub adult male New Zealand Sealions also call it home and swam around with inquistive looks. Next target the Auckland Islands, we should reach there in the early hours of Sunday morning. I am looking forward to this as I spent the summer of 1995 there as part of the Department of Conservation Sealion Recovery project.